With all the hype and excitement prior to this big event I made sure to arrive a few days ahead of the race to give myself enough time to prepare and join in on some of the pre-events that the race has to offer. 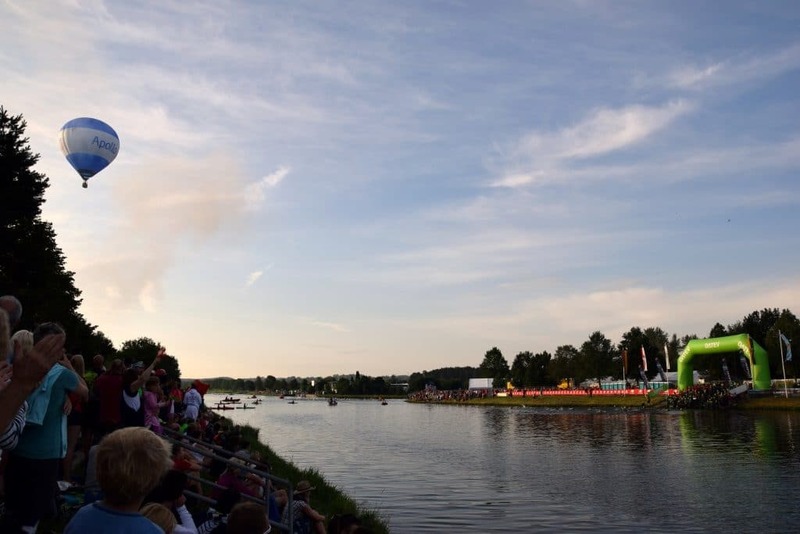 I was in Roth as a spectator last year so I knew how crazy it will get come race day. Training wise I had cut down a lot on volume and intensity in the last 3 weeks leading into the race. 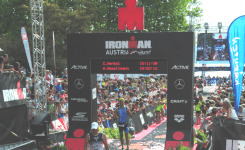 Learning from last year’s Ironman where I felt a little bit tired and not 100% fresh on race day. This year I wanted to be 100% fresh and race ready, trusting in my hard work that I have put in the months before. The days before the race I felt very relaxed and comfortable but at the same time I was also very focused and determine. My biggest worry was the weather forecast to be honest. It was predicted to be a very hot day and I know that racing in heat can be a big limiter. But rather than worrying too much I tried to focus on the things that I can control such as my pacing strategy and the fuelling. I had put down a plan for that so I said to myself there is nothing to worry about. On my 5-hour drive to Roth the days before I was listening to some of the podcasts from Matt where he discussed how to race in the heat and how to manage the terrain. That gave me some more confidence going into the race. I was well prepared. 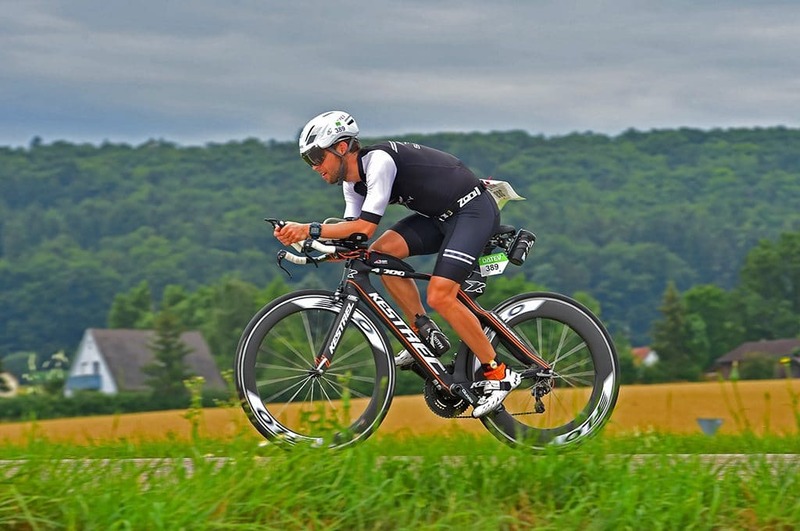 To make sure I didn’t fall into a lethargic state prior to race day I kept the body active by doing an open water swim to check out the swim course, rode some of challenging parts of the bike course and went on two more runs. Nothing crazy really. The body felt good and that removed the worries. I was ready for it and probably in the best fitness and readiness shape that I have ever been so far. I arrived very early on race morning to give myself a lot of time to set everything up and spend some more time with my friends and family who joined me in the morning. Everything went smooth and by the time I finished setting up T1 I had more than 1 hour to go before my wave went off. The place around T1 was filling up quickly with spectators and I have never seen so many people lining up to watch the swim start of a race. It was brilliant and the atmosphere was electric. The warmup area didn’t really allow to do a proper warmup, so I did a few mobility drills to loosen up my shoulder joints and some breathing exercises to calm down the nerves and get focused. In the warmup area, there were also all the pros getting ready so it gave the feeling that we are all in this together as we must go through the same. You could tell that the tension was building up and everyone was ready to race. The place by this time was pumping. 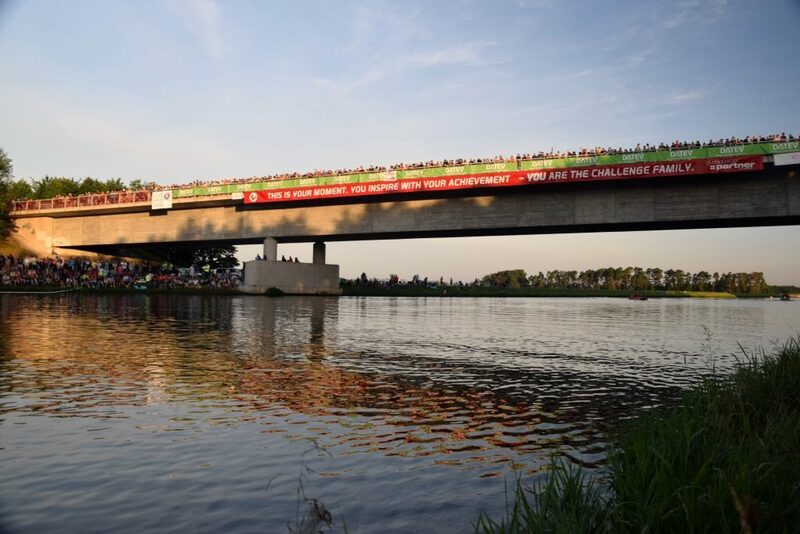 Thousands of people lined up along the canal and on the bridge and it gave me some goose pumps when I entered the water to start the swim. I have never seen such a big crowd in a race before. Once the gun went off for my wave I let the fast guys take off and then I settled into my own rhythm. It was a big group with a lot of guys so the first few hundred meters were a bit hectic. I didn’t let myself get distracted and just focused on my own swimming. Finding a rhythm wasn’t that easy but after a few hundred meters I got into it and started to swim smooth and very controlled. Knowing that it will be a long and hot day out there I was swimming at a comfortable place. The rest of the swim was pretty un event full. It was an almost straight-line swim with 2 turns. By the time I was making my way back to the swim start I thought that it was a slower swim than usual. On the last few hundred meters you could hear the noise of all the spectators. Every now and then I took a glimpse on the side and there were just people everywhere. It was unreal! When I exited the water, and ran into T1 I just had a look at my watch and too my surprise it showed a time of 59 minutes. That was a 1 minute quicker than my last Ironman swim. Happy with that I flew through T1 and by the big applause of all the spectators I got onto my bike and off I went for lap one of the 2 lap bike course. My plan for the bike was to not go out too hard on the first 15km and stick to my power. I was surprised how quickly I got into a good rhythm so it was hard to hold back and not get too excited. I managed the first 2 inclines on the first 20km well and my legs felt good. The road to the first longer climb in Greding was mostly flat. I put my head down and settled into a strong but sustainable effort. I was passing a lot of riders on the first 50km. Prior to the race I rode the Kalvarienberg climb so I knew what to expect. On the day, it was filled with a lot of spectators who were pushing you up the hill. I sticked to my plan and didn’t go overboard on this one. Controlled and strong, lower cadence, higher power, getting out of the saddle and pushing over the top of the hill. Easy stuff I thought, it felt good and the climb didn’t do much damage. From there onwards the ride continued to be smooth. I managed the technical downhill sections not too bad this time. Listening a couple of times to Matt’s and Paul’s talk about managing terrain helped 😉 Riding downhill is still a weakness where I lose time, so more practice needed. The road conditions were perfect and there were not too many riders on the road, so I kept some good momentum on the downhill parts. One of the highlights was definitely Solar Hill. When I took the last turn before the climb I couldn’t believe what I saw (or didn’t see haha). There were just spectators everywhere. Thousands of them and it was almost impossible to see the road as it was just packed with people. I had no one in front of me riding when I started my Solar Hill climb and the crowd just went ballistic. I had a big smile on my face as I was climbing up the hill. Amongst the big crowd I spotted my family and friends which was awesome. I could tell they had as much fun as I did. I soaked up the energy I got from the crowd and it felt great. The last 20km of the first lap went by way too quick and I couldn’t believe that I was already on my second lap. This was too easy, right? After the first lap, I did a quick check how I was progressing. My average power was spot on where expected it to be and I was also happy with my average speed knowing that I haven’t overcooked the first lap and still have plenty of energy left for lap two. I continued my second lap and pretty much executed it the same way as the first one. After the race, I checked my data and my second lap was only 20 seconds slower than the first one. I thought that was pretty good. Before the race I put big hopes into my run performance as I have developed some good resilience and run fitness in the last couple of months. Looking back at my first Ironman experience last year, I experienced firsthand what it’s like to run a marathon in an Ironman. So, I was prepared to suffer and struggle but trusted in all the work that I have done. It took me 2-3 km until I found a good rhythm. First, I experienced some pain in my left food sole which just dissolved and never returned during the race. I took on some nutrition at the start of the run and my plan was to stick with Gel + Water as long as possible. The first 10km went by pretty quickly and I felt really good holding my target race pace of 4:45min/km. I was confident to maintain that pace as the heat was not as bad as initially thought. The new run course in Roth has its new challenges. In the 2 lap course there are longer inclines that are quite challenging. Once I passed km 15 I started to notice a level of fatigue and heaviness in my legs building up. At this stage I wasn’t overly worried and kept pushing. As the run went on it was harder and harder to maintain a good rhythm and pace. The up and downhill running made it difficult to maintain a good pace and I started to struggle. My pace dropped to about 5:00-5:10 min/km and it was a battle to hold it. After the first two laps (km22) my energy levels dropped again and I knew that very soon I need to get more sugar into my body to stay alert and focused. The temperature started to raise as well and at the km 25 mark the pain was real and the mental game was full on. The great support and the massive crowds on the run course helped me a lot to get through this part of the race. 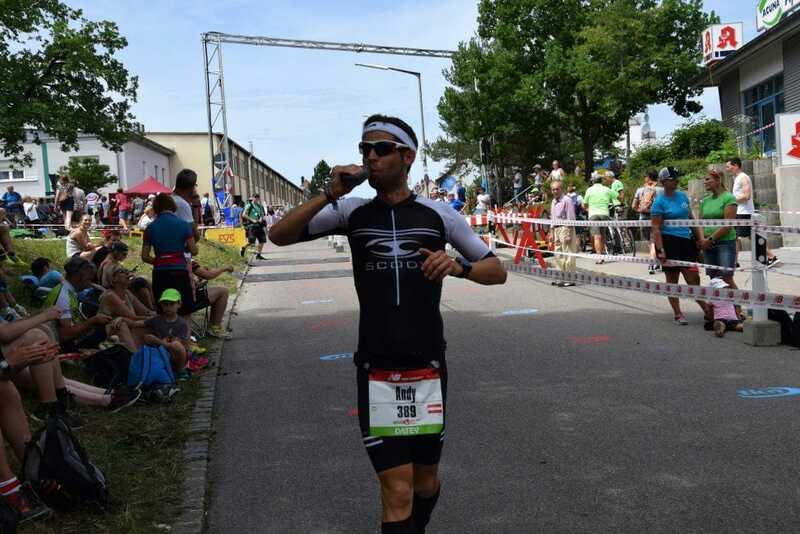 Knowing I still had to run out to Büchenbach on the last lap was hard to swallow (that is a long incline), especially as you run past the finish a couple of times during the race. I had to put my act together at this point. I took walk breaks at every aid station to take in nutrition. Coke and water on the last 1hr of the run. I cooled down the body as much as possible to avoid overheating. The legs were in limbo state and very stiff and heavy. Turning the legs over became a real struggle but I said to myself, it’s only 1 hr to go. Other runners on the course, the atmosphere and the thought of the pre-race food and massage lifted my spirit. I pushed through the pain and fatigue and was even able to pick up the pace again on the last few km. The last 2km to the finish line were awesome. You run through the city centre where thousands of people are celebrating and cheering you on. It was such a good moment in my triathlon career. I really enjoyed that part the most, knowing I am so close to home and delivered a good race. I was just happy and satisfied. On the last few hundred meters I saw my parents and friends, I hugged them and everyone was just happy and proud as well. 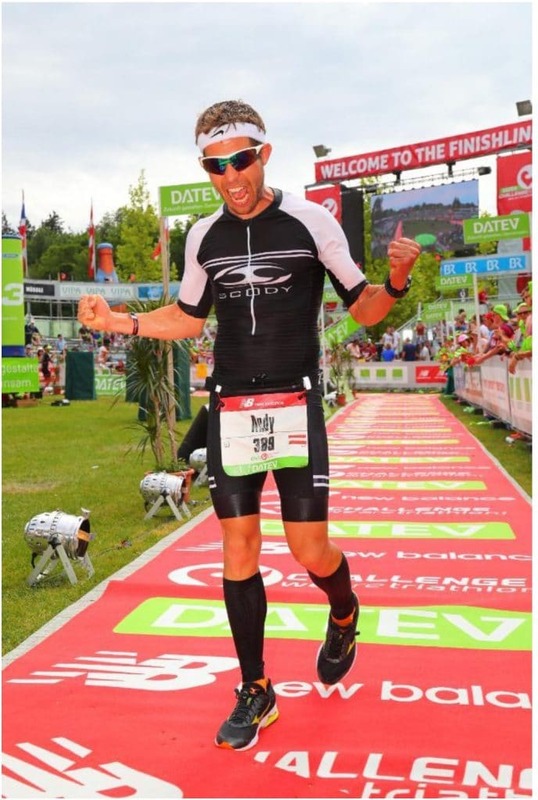 Passing the finish line in Roth was a moment in my life I will always remember. Crossing the finish line in the biggest and most spectacular triathlon in the world, was a good reminder why I love this sport so much. At the end of the day everyone participating in such a race has their own reasons. I think you need to have a strong “WHY” to be successful in this sport in your own terms. I realised that when I watched the last finisher crossing the line and the emotions, celebrations and feelings that go along with that. It’s not about winning or setting PBs that make you a great athlete, it’s about what you create for yourself and other people around you. I was inspired by people who didn’t race to win, I was inspired by the impact they can have on other people. We are very privileged to be able to do this sport and I think to give back some of that inspiration and positivity to other people is very important. At least for me and I hope that my journey in this sport can inspire and influence as many people as possible so that they can find their own path to live a more passionate, fulfilling and happy life! For now, I am going to enjoy 2 easy weeks of no structured training before I get all my energy focused again for the last built for Ironman Italy End of September.